There is always the option to study and work from home. You might be wondering how that really changes things, but it actually does. When you study from home and then use your new skills to start your own home-based business, you won’t need to sit before a panel of judges and impress them with your skills and you won’t have to worry about minimum wage implications putting you out of the job market. If you aren’t convinced yet that working and studying from home is the ultimate answer for you, we will give you 5 reasons why it is. • The money you make is yours to keep. When you work for someone else, you are aiding them in building their empire, not yours. When you work for yourself, you get to decide how that money is saved and spent. Once you are established, you will be in a far better financial position than you can ever be if you continue to work for someone else. • Your time is your own. When you study or work from home, there is no need to be anywhere at any particular time. If you are a night owl, you can study or complete client orders at midnight if you like. No one is going to dictate your hours to you, as long as you can get the study assignments done or clients orders out on time. • Broaden your scope of opportunities. As an employee of someone else, you will earn a certain salary every month and be expected to complete the same tasks or functions day in and day out. It is natural for markets to experiences slumps from time to time. If you work for yourself, you can get creative about what your business does and how it services its clients. This means that you can grow and change with the fluctuating market. And you can make more money in the good times instead of being stuck with a set salary, even when the business is soaring. • Keep your family balanced and running smoothly. Family life is important to everyone. If you are planning to start studying when you have a family, or start a new job, that family time is going to be dramatically decreased. When you study from home towards your future, there is no need to sacrifice your family time. And when you start working from home, you will be able keep up with your daily family commitments such as dropping off and collecting kids, helping with homework, completing basic household chores and so on. • Having your mind set on running your own business can be scary, especially when you consider the associated costs. You can keep costs to a minimum by working from home. There’s no property to rent, no signage required and you won’t have to hire additional employees to act as a front to your business. When you work from home there is far less financial risk involved. The benefits of studying and working from home are many! 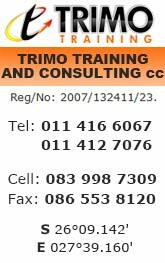 If you would like to find out more about courses that you can study from home and business opportunities that you can quickly and easily start from home, get in touch with us at Trimo Training. We have just the variety of courses and start up business ideas for you!